Thursday was the last day of the conference. In some ways I was sad to part from my friends and in other ways I was glad to return home. This week felt longer than your usual conference week and it seems like I’ve been away from home for at least a month. Today was a half day of formal presentations and sessions. My 2 panels were scheduled for this day. In my first panel, I sat with Gabby, Kumar, and Glenn. We discussed the winning combination of Essbase Cloud and Data Visualization tools (both on-prem and cloud) with spreadsheets and how they integrate and work together to provide robust information. First Gabby did an introduction and overview of the tools and their value premise. 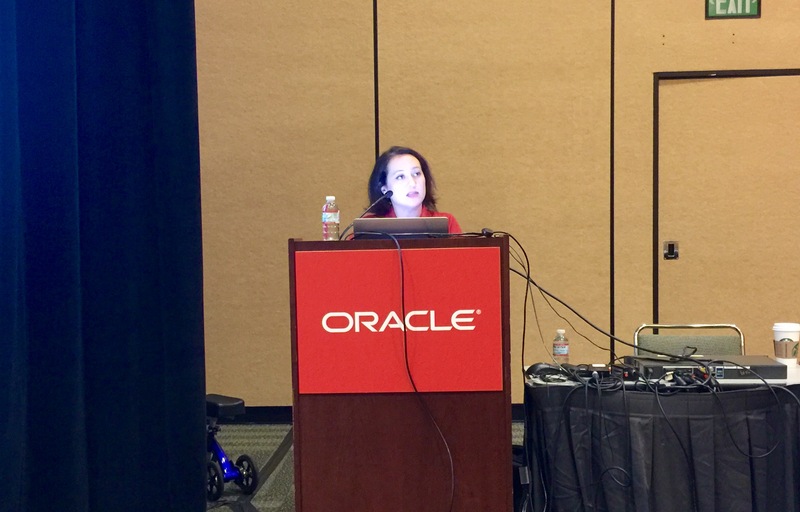 Then I introduced the interRel team and covered a use case about how the ODTUG Kscope team is actively engaged with Oracle in an evaluation of DVCS. Our Kscope conference committee is taking the beacon data from Kscope16 and creating visualizations to better consume the data and create metrics to improve future conferences. If we move forward, we hope to incorporate Essbase Cloud next to continue the deep analyses and provide richer calculations. Glenn discussed interRel’s customer and how they are looking to go to Essbase Cloud + BICS. They currently have on-prem Essbase and OBIEE and would like to move to Essbase Cloud as soon as it’s released so they can take advantage of all of the benefits cloud has to offer. They recently had a successful EPBCS implementation and are gung ho about cloud. Then Kumar finished up the session by giving previews of the interfaces that will be released with Essbase Cloud. Panels are fun. As a single speaker, there’s no pressure to present all of the content. In addition, presenting with someone you know can be very entertaining for the crowd. TRCS (Tax Reporting Cloud Service) is the cloud version of the Hyperion Tax Provisioning solution (which is built upon HFM). TRCS is yet to be released but is scheduled for the end of this calendar year. It will work directly with both FCCS and HFM and Oracle has a migration path from Hyperion Tax Provisioning to the cloud. Closely aligns you with book reporting, general ledger, HFM, etc. Tax provisioning, direct tax, etc. Supplemental Schedules (SDM) – handles high-level, transactional data. Complement multi-dimensional data collection in HTP, manages distributed surveys and forms, and includes filterable lists. Country-by-country template – HTP has pre-built template in 11.1.2.4.100 and updated in 11.1.2.4.200. CBC needs data from HFM and HTP. 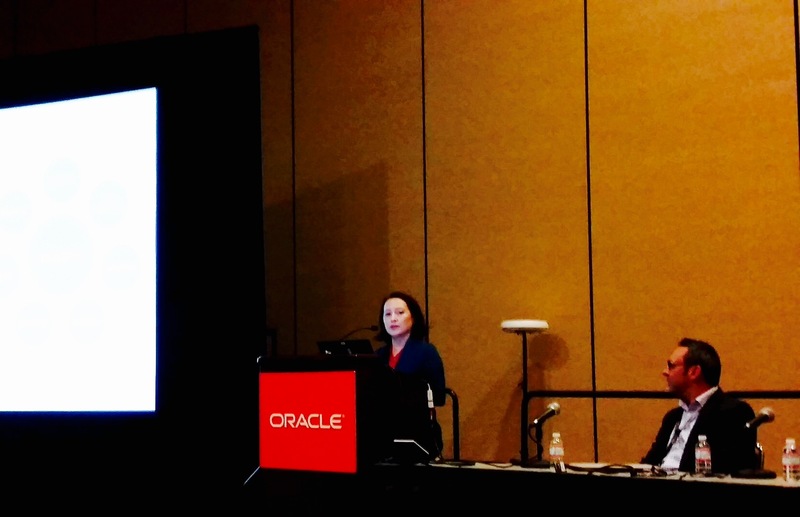 My second and last panel for OOW16 included one on EPRCS. Qubix and Investec went through their international implementation of the EPRCS technology and I covered some high-level thoughts on the North American perspective, reporting challenges today, and notable features of the product. In North America, EPRCS is still a somewhat misunderstood technology. It’s a complementary reporting solution that can leverage existing Financial Reports and Smart View components. However, it’s purpose-built around reporting packages (internal, regulatory, etc.). I will have a blog series on this technology coming out soon. This panel was fun and it was cool to meet another EPRCS consultant, Neil Sellers from Qubix. Andrea Tapp (of Investec) did a great job of walking through their use case and then explaining the implementation details and ROI gained. After my last panel, my buddy Wayne and I jetted directly to the airport. I had to catch an afternoon flight back home. My first OOW16 was fantastic! I got to present, attend sessions, meet new friends, catch up with old friends, celebrate wins, party hearty with Gwen Stefani and Sting (and tens of thousands of Oracle fans), and enjoy the backdrop of San Francisco. I can officially cross this off of my career bucket list. If you’re unfamiliar with the area and you attend briefings prior to OOW, look up those locations and reserve hotels accordingly. I just assumed it was all downtown in the OOW area so I stayed downtown instead of near the airport and had to Uber back and forth for my advisory meeting the Friday before. OOW provides only lunch from what I saw (and that was questionable – remember, they’re feeding 50,000+ people). They also provide dinner at the appreciation event. There are so many meetups and socials that will provide hors d’oeuvres to cover most dinners. But breakfast is on your own. There are a number of convenience stores within walking distance where you can grab snacks and breakfast to reduce costs. Restaurants and fast food joints within a 3-block radius are insanely packed every day of OOW. Most don’t take reservations during OOW. The weather is crazy. Some days were in the 80’s and humid. Other days were in the 50’s and 60’s with a cold breeze. Pack layers. I was constantly recharging my phone each day. There is something for everybody. If you want to party late, you can and there are many social events for this. If you want to turn in early, you can and no one will blame you. Zinc + green juice + vitamin C on a regular basis kept me from getting sick. There was nothing I could do about losing my voice, however. Hotel prices are crazy – there isn’t much you can do about this. The closer you are to Moscone, the more expensive they are. Most of the sessions are very high level. I didn’t see many technical sessions. However, the Product Development teams are on-site if you have technical questions or issues to discuss. The OTN Lounge was a cool spot to hang out and meet other Oracle ACE’s, as well as be recorded for interviews. Uber and Lyft are your friend for those late nights if you have no one to walk safely back with. Expect to walk miles and bring comfortable shoes. I was in constant competition with my Apple Watch/Fitbit friends on how many steps we walked each day. The dress range varied by quite a bit, but I would say that this conference is a bit dressier than the norm. Many folks on panels (especially with customers) wore dressier business casual (sport coats, etc.). There were 2 exhibit halls. TWO. It took me 2 days to realize this. The initial planning experience was overwhelming. I didn’t know what to attend and there are many conflicts for each session spot. Between the keynotes and the general sessions and the panels and the regular sessions, I am not sure if I saw everything that I wanted to see. Some sessions were recorded – but they record something like a couple of hundred across the entire conference and all technologies. Pack a suitcase that will give you extra room for carrying stuff back. I brought back with me a new backpack, a new Oracle water bottle, swag, an airplane pillow (given to partners), and some new shirts. I wasn’t expecting all of this. Would I do it again? Yes, but maybe in pieces. The most valuable part for my role was the advisory meeting the Friday before. I did enjoy speaking, but found that EPM isn’t a big draw in general – most sessions averaged 20-40 people. I guess I’ll wait to see where next year takes me! Note: Oracle released a link to the OOW16 on-demand videos (general sessions, keynotes, interviews, etc.). You can find them here. And a big shout out to the folks sharing my blog posts! Much appreciated! I hope you enjoyed them!